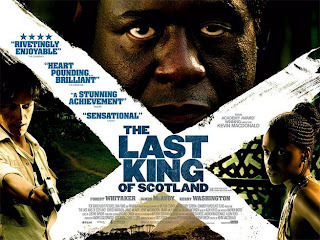 Forest Whitaker received Best Actor Oscar award for his portrayal of Idi Amin in the The Last King of Scotland, a confusing title for a horrifying portrayal to a mad man's psyche. I have read about Idi Amin and the number of people slaughtered during his tenure looked like an over estimation to me after watching lots of documentaries as well in History and National Geographic Channel. But the way this film tears apart his inner psyche is worth mentioning. The Production Design is noteworthy and casting looks like a great coup. Forest does great justice to his role, seeps down to the character and James McAvoy best known for this role in The Chronicles of Narnia is a most likeable character in the film. When he sleeps with Amin's Wife and the sudden spurt of passion in their relationship clearly reveals what’s is in store of him soon enough later. The violence is graphic and at time, I had to shut off my eyes, and doing that was quite unbelievable for me, for the very fact that, this is no fiction or heightened sense of reality but plain reality. What really works for the film is the very sense in every sense that something like that in Amin's regime can be easily imaginable. The story is so simple and predictable that at the beginning I have very low expectations from the film. But, the degeneration of his character in stages was although predictable butgrew scary by every scene. Towards the end of the film, you just couldn't imagine, how worse can it get. The camera work was brilliant and yes, not to forget the production design. Amin histrionics performance when he travels through his constituency and his high handedness in his administration. McAvoy's performance is worth mentioning and there is a certain aura of innocence all through out the film. The very fact, we are witnessing the film through the eyes makes it a clear caricature of Amin's character, the very fact that he had an easy access and anytime access to Amin's apartment clearly shows the identification of the audience with Amin's character. the vary fact, that it is McAvoy's view in the film, and so is ours, we are equally shared to all information on Amin when we clearly know about Amin knowledge of McAvoy's profanity. Violent, gory and relentlessly gruesome are some understatement to the last half an hour of the film. Watch this film only if you have a heart otherwise be happy reading the novel and shutting it after it gets over. 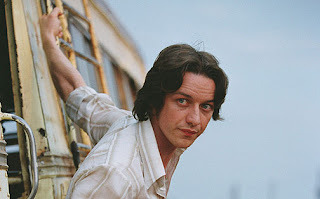 Story Plot: In 1971, newly graduated Scottish doctor Nicholas Garrigan (James McAvoy) quits Scotland for Uganda to escape the talons of his overbearing father. Nicholas arrives in the African nation around the time that a military coup puts General Idi Amin (Forest Whitaker) into power. Amin is a magnetic and popular leader. When he is injured in an automobile accident, Nicholas is the nearest doctor, and he is brought to attend to the wound. Amin is taken with the young Scotsman, and offers him a position as personal physician to the President. It's a job Nicholas can't refuse, although he will come to wish he had done so. At first, his experience living at Amin's residence is entirely positive, but as the ruler's paranoia begins to assert itself, Nicholas discovers that no one is safe.